BEAMS Program Research Cruise Each year College of Charleston BEAMS students have the opportunity to sail aboard a research vessel. During the 3-day cruise they learn the data acquisition side of seafloor mapping. Instrument Deployments While at sea, students get invaluable hands-on experience of deploying instruments such as a sediment grab-sampler. Sediments provide information on the seabed's character. Backscatter Classification Students learn to characterize and classify the seafloor using acoustic backscatter data. Images rendered provide information on habitat useful for fisheries, deep coral and many other areas of marine science. Research Vessel Savannah One of the ships used for BEAMS Program cruises is the 92' long R/V Savannah, operated by Skidaway Institute of Oceanography and supported by the University-National Oceanographic Laboratory System (UNOLS). Surfing the Bow Wave Always a favorite sight, bottlenose dolphin often accompany the ship, enjoying their time while surfing the ship's bow wave. Seamount Research Hundreds of new seamounts are being discovered annually. BEAMers have the chance to explore many of them using new multibeam sonar data shared by NOAA and other investigators. Side Scan Sonar BEAMers collect seafloor acoustic images using a towed side scan sonar instrument. Charleston, South Carolina The BEAMS Program originated at the College of Charleston in South Carolina. Bull Scarp In 2011 BEAMers sailed aboard the NOAA Ship Nancy Foster and collected stunning multibeam sonar data of this major promontory at the continental shelf edge off of Charleston. Water depths range from 45 m (red) to approximately 250 m (purple). BEAMS Program Research Cruise Each BEAMS Program research cruise involves as many as 14 students and 3 lead scientists. Cruises range from 2 to 4 days. Submarine Canyon Research Several students work with NOAA scientists to characterize submarine canyons in search for deep sea coral habitat. At-Sea Experience BEAMS students have opportunities to sail on research vessels, and learn data collection techniques, including deployment of instruments to collect water column temperature and salinity. Data Acquisition and Post-Processing While at sea, BEAMS students learn critical software for planning and acquiring multibeam sonar data, then post-process the data to produce 2D and 3D images to visualize the seafloor. Research Areas Students who take the BEAMS Research class use multibeam sonar data from a wide variety of sources including INFOMAR, Ireland's mapping program led by the Marine Institute of Ireland and Geological Society of Ireland. 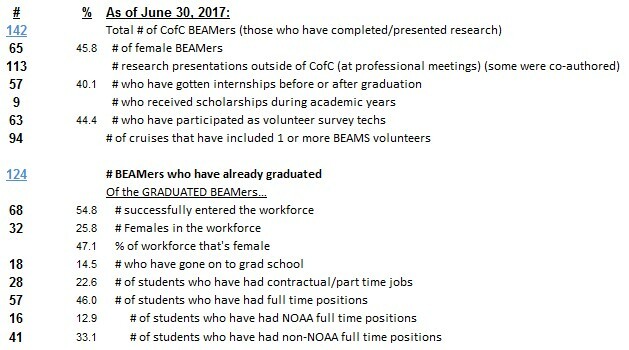 The BEAMS Program is an undergraduate-focused training and research program with the mission to develop a strong and qualified workforce of ocean surveyors in support of the academic, research and operational marine communities. The program was founded in 2007 within the College of Charleston's Department of Geology and Environmental Geosciences and was expanded in 2011 to include the University of Washington's School of Oceanography. BEAMS students learn to use state-of-the-art multibeam sonar data processing software to generate bathymetric maps and acoustic backscatter imagery for seabed classification. Those who elect to reach full "BEAM TEAM" status, continue on to the research course, which offers a multi-day at-sea sonar data acquisition cruise and requires a full research project using data either from NOAA NGDC or collected during BEAMS cruises. Students present their results at regional and national meetings annually. Development of supplemental field-based courses for sidescan sonar and sub-bottom profiling, workshops for training in additional software, and plans for summer institutes are all underway. The program is not grant supported, but is maintained through each home institution’s funds, along with partnerships from industry. Primarily from an Academic Program Partnership with Teledyne Caris. To date, over 160 students at the two institutions have participated in BEAMS. More than half of the students who have graduated have successfully pursued graduate school or sought employment in the marine geospatial field. 45% of this workforce is female. The combination of learning new technologies and software, conducting and presenting research, and gaining hands-on field experience has proven to be a strong attractor for students; and job, graduate studies, internships and volunteer opportunities have grown as the need for higher resolution seafloor images and maps has increased globally. This website mostly highlights the College of Charleston program. For more information on UW's program, contact Dr. Miles Logsdon (mlog@uw.edu). on the College of Charleston BEAMS Program Alumni successes. The at-sea experience offered through the BEAMS Program is the hallmark of this one-of-a-kind undergraduate research program. Support for annual ship time is the primary way in which the BEAMS Program can maintain the level of excellence for which it has come to be known. If you're currently employed, please be sure to inquire if a match to your donation is possible. Our GOAL is to raise $20,000 by March 1st so that the cruise this spring will be possible. Thank you for helping to ensure that future BEAMers are able to participate on the BEAMS shipboard experience. A core of required elective courses teaches students a comprehensive suite of critical software, technologies and other skills for use in ocean surveys. The foundation course, Introduction to Seafloor Mapping (“SeaMap”) provides training in CARIS HIPS. Students learn the software using data from NOAA, USGS, and other sources. Students each conduct independent research, applying their skills to geological and biological studies. Partners from NOAA, USGS and elsewhere provide datasets for student research. Nearly every student presents his/her research at a regional and/or national meeting. Practical at-sea experience is a cornerstone of BEAMS. Students have a unique opportunity to sail aboard a research vessel during a BEAMS-dedicated multibeam sonar survey cruise. During their time at sea, students learn the instrumentation for data collection as well as the planning and data acquisition software. They also post-process data during each survey and begin analyzing their results. Through industry and government partnership development, BEAMS will continue to promote development of numerous student internship opportunities. These internships range in duration, scope and pay.